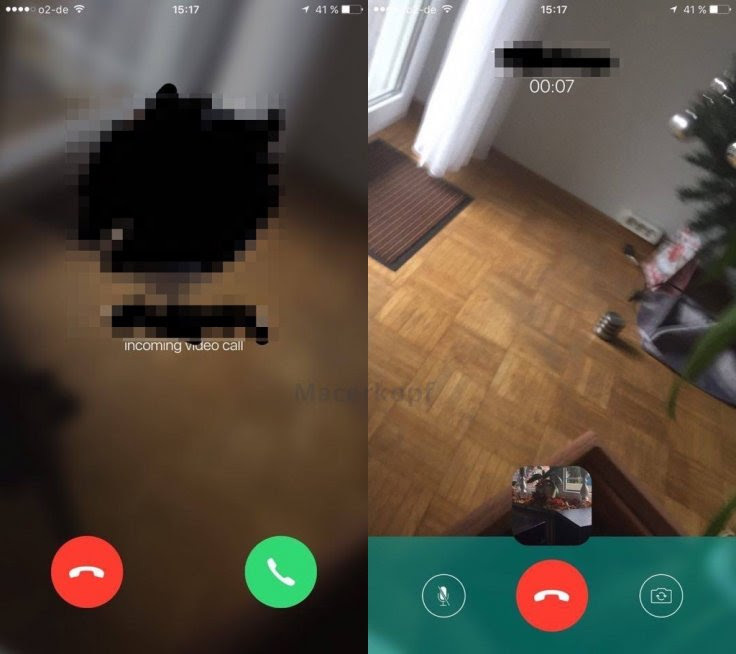 Facebook's year-old plan for introducing video calling feature in its WhatsApp messenger appears to be finally attaining fruition as a couple of recently leaked images via German Apple blog Macerkopf.de suggest its imminent release. The app is expected to see the addition of multiple messaging tabs that enable dynamic switching between your favourite chats, along the lines of popular messaging platforms such as Skype, Viber, Apple's FaceTime and Messenger. According to a recent post on Macerkopf.de (Google Translated), the newest build of WhatsApp with (v2.12.16.2) is expected to see the ability to send or receive video calls directly via WiFi or cellular services. Users will be able to preview their own face in a small window, which overlaps on top of the video feed from the caller. One can also move around or reposition the preview window on the phone's screen, based on their needs. Besides, users can switch between standard controls such as flipping between the front and rear camera or muting the microphone. Using multiple chat tabs, one can dynamically switch between individual conversations without needing to revert back to WhatsApp's chat list. The app is reportedly being redesigned to promote the Go Green concept. The latest build number of WhatsApp (2.12.12) suggests that the video chatting feature is likely to hit the App Store with the app's next update. The audio calling (VoIP) feature of WhatsApp has been available since April 2015.